Please review the Clarkston LCI report by clicking through the link below! Thanks to all that attended the Draft Plan Presentation. Please use the comment tool on this page and others throughout the website to add additional feedback on the project! Draft Plan Presentation Meeting: February 10, 2015 @ 6:30PM! THANK YOU TO ALL THAT CAME OUT ON SATURDAY FOR THE MARKET STREET EVENT! NEW Please visit the updated Documents, Maps and Public Involvement sections! 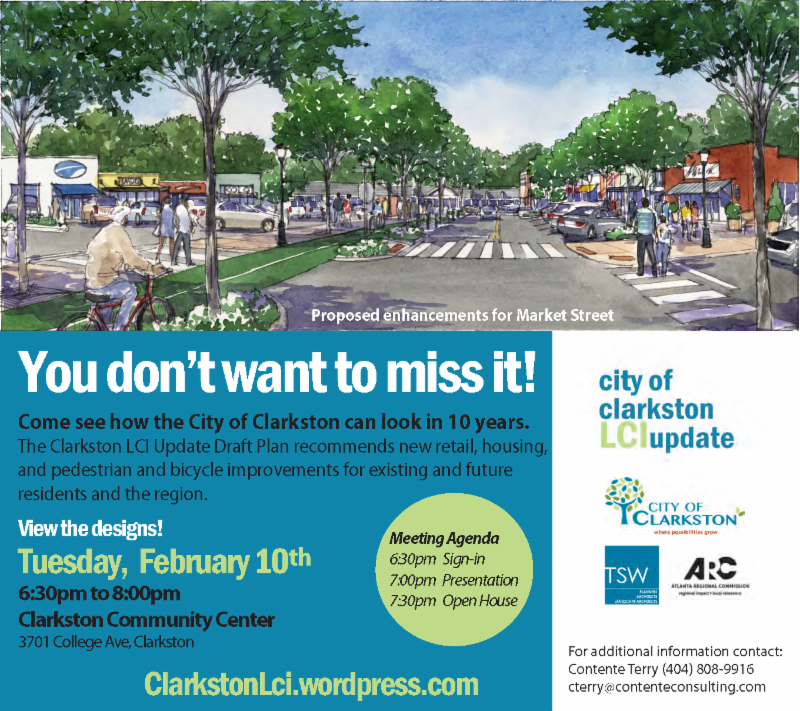 Thank you for visiting the Clarkston LCI 10 Year Update webpage! This site will include news, meeting schedules and progress updates throughout the project duration. Please check back frequently and read the project introduction below! Clarkston, GA has tons of potential. I personally think the first thing that needs to be done is the town needs a face lift. Modernize the look of the town up a little bit. Invest into education. These things I believe will cause people to come and invest in the town with more businesses and economic growth and for god sake’s put a red light at the end of Mell before someone gets killed turning on to East Ponce De Leon. When the Ponce Grill parking lot is full (Which is most nights). It makes it so dangerous pulling out.